The grief that you experience after losing a loved one is difficult to understand, and often comes at a time when your attention must be focused on preparing to bury that person and remember them through funeral services. For many people the process of planning for a funeral is overwhelming at such a time of loss. In addition, you may be dealing with financial stress if your loved one died unexpectedly and without a funeral plan. With so many important details that follow a person’s death, it’s important to hire a funeral home that you can trust. 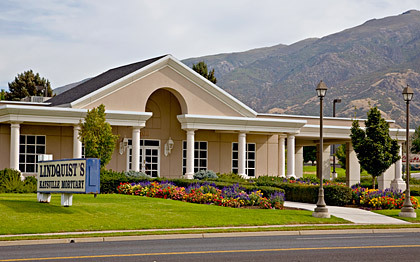 Lindquist Mortuaries and Cemeteries have been part of the community for more than 140 years, and provide the best services of any mortuary in Kaysville. We offer a wide range of high quality assistance, so you can focus on the things that matter and won’t need to worry about all the little details. In addition to cremation and burial choices, we offer pre-planning services to help people prepare for the inevitable. While death is never a preferred topic of conversation, planning for it in advance can help ease the financial burden it places on your family and friends. We offer insurance-funded plans with comprehensive coverage so you can have peace of mind knowing those costs will be taken care of after you pass away. Choosing the right plan for you can be hard—there are a variety of insurance products to choose from—so let our experienced family service counselors facilitate the process and aid you in choosing the most beneficial plan for your needs. There are a lot of personal and financial things that must be taken care of following a person’s death, and if you have never been through the process before you may not even know where to begin. At Lindquist Mortuaries we provide a free aftercare program to assist families in processing social security benefits, insurance claims, credit union account updates, and more. Let our mortuary in Kaysville help you with everything from pre-planning a funeral to aftercare assistance. Contact us for inquiries.